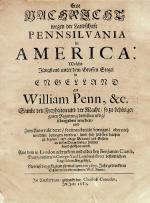 Soon after acquiring his North American colony from King Charles II in 1681, William Penn travelled extensively in Holland and German regions to openly solicit German settlers to Pennsylvania. 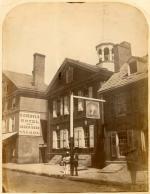 In 1683, the first Germans, a small group led by Francis Daniel Pastorius, settled in "Germantown" in 1683. Between 1683 and 1783, more than 100,000 German-speaking immigrants from the Palantine, Wurttemberg, and Hesse; the Swiss cantons of Basel, Bern, Zurich; and from Alsace and Lorraine would stream into Pennsylvania and other parts of British North America. The bulk of this massive influx of farmers, artisans, craftfolk, and religious pilgrims of many denominations came through Philadelphia. The trans-Atlantic journey was long, arduous, and expensive. To finance their passage (most crossed the Atlantic on Dutch ships), thousands of Germans signed indentures that bound them to work for five to seven years before they acquired their freedom. 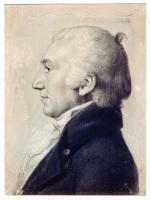 Henry Keppele, attributed to John Hesselius, circa 1770. Packed tightly into ships and then provided with inadequate food and water, thousands died making the journey across the Atlantic. The death of a father could jeopardize an entire family's future prospects, for the cost of his passage still had to be paid, even if he died en route. "Redemptioners," who came without a contract, hoped to find relatives or friends already settled in Pennsylvania who would pay for their passage once they had arrived. Those would went unredeemed, however, were sold at auction by the ship captain to men called "soul drivers," who marched them like cattle or sheep from town to town and sold them at auction as individuals or in lots, separating husbands from wives and parents from children. "Sad and miserable" noted Gottlieb Mittelberger was the fate of many thousands of German families who made the voyage to Pennsylvania. On December 26, 1764, sixty-five men, all German or of German descent, met in a Lutheran schoolhouse in Philadelphia to address the horrors experienced by German immigrants. There they formed the German Society of Pennsylvania (GSP) and resolved to petition the Assembly to enact a law to protect immigrants from the worst abuses. Less than a week later, they submitted a nine-point petition to the Pennsylvania Assembly calling for more space per passenger, better sanitary conditions, and more humane treatment on ship and on shore, that Governor John Penn signed into law in May 1765. 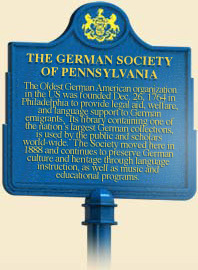 Attracting some of the city's most prominent German-American residents, the German Society would go on to provide a broad range of support and services to German immigrants to Pennsylvania and later become a center for the preservation of German culture and heritage in the United States. From its founding, the society drew its membership from Philadelphia's German elite. Like many immigrant benevolent associations, the GSP established a well-deserved reputation for protecting those unable to protect themselves. It cared for the sick, assisted the poor, supported schools, and opened a large library. In the 1770s the Society also became a gathering place for the growing public influence of the so-called "German Party" in Philadelphia politics and military affairs, especially after many Quaker leaders chose not to take sides during the American Revolution. In the 1800s, the German Society also became a center for the preservation of German culture and folkways, and the history of Germans in America. From colonial times to the present, one of the distinguishing features of the immigrant experience has been the drive to preserve and promote native heritage. 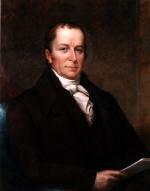 Simon Snyder, Governor of Pennsylvania, 1808-1817. Successive immigrant populations established their own organizations to reinforce common or shared identity and maintain mutual support in a time of increasing pressure to assimilate into the mainstream society. Irish, Scottish, Jewish, Italian, and southern and eastern European immigrant groups each established self-help organizations to lend assistance and to preserve the old ways far from home. The Irish Ancient Order of Hibernians, the Slavic Sokol Society, and the Polish National Alliance are examples of this tendency in Pennsylvania and American history. Early migrants to Pennsylvania identified as "German" came from small states and principalities across central Europe. 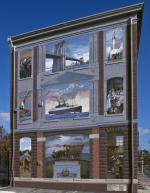 In all, some 65,000 German-speaking immigrants settled in Pennsylvania prior to the American Revolution. Some German migrants fled intolerance and persecution, and others sought the economic and social freedom imbued in William Penn's promise of toleration. Pennsylvania's "German" newcomers were remarkably diverse, religiously and culturally. Most German-speaking immigrants came from central and northern states and were Evangelical Lutheran or Calvinist in religious faith. Pennsylvania also attracted German religious separatists, Anabaptists, whose ranks included Dunkards (Baptists), Amish, and Mennonites, who settled in Lancaster and Berks Counties, and are today thought of as "Pennsylvania Dutch" (or "Deutsch") These Germans-Plain People, they are called-were almost exclusively farmers who lived in tight-knit and insular rural communities that kept a distance from the mainstream "English" world that surrounded them. The German immigration also included Moravians (Brethren), who founded the city of Bethlehem in 1741. By 1900, membership in the GSP stood at almost 700. Like most German-American organizations, the Society found the First and Second World Wars especially difficult periods. With the United States at war with Germany, the rising tide of anti-German sentiments undermined the society's agenda of fostering respect and good will for German culture and identity. Following each war, the GSP actively participated in post-war relief efforts across central Europe. In the early twenty-first century, the society continued to maintain a library, to offer German language courses, and to foster an appreciation for German folkways and customs. Today, the society's library of more than 300,000 volumes is one of the finest collections of German language texts in America, and an outstanding repository to the German contribution to American history and culture. 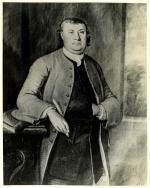 Charles H Glatfelter, The Pennsylvania Germans (University Park: Pennsylvania Historical Association), rev. ed. 2002. Harry W. Pfund, A History of the German Society of Pennsylvania, Founded 1764 (Philadelphia: German Society of Pennsylvania), 1944. A.G Roeber, Palatines, Liberty and Prosperity: German Lutherans in Colonial British America (Baltimore: Johns Hopkins University Press), 1993. Dietmar Rothermund, "The German Problem of Colonial Philadelphia" in The Pennsylvania Magazine of History and Biography, 3-21January 1960. Marianne S. Wokeck, Trade in Strangers: The Beginnings of Mass Migration to North America (University Park: Penn State University Press), 1999.